Fish is delish, and it’s totally period. Salt it, smoke it, fry it, poach it, bake it, make it into a mix for invalids, put it in a coffin (pie). 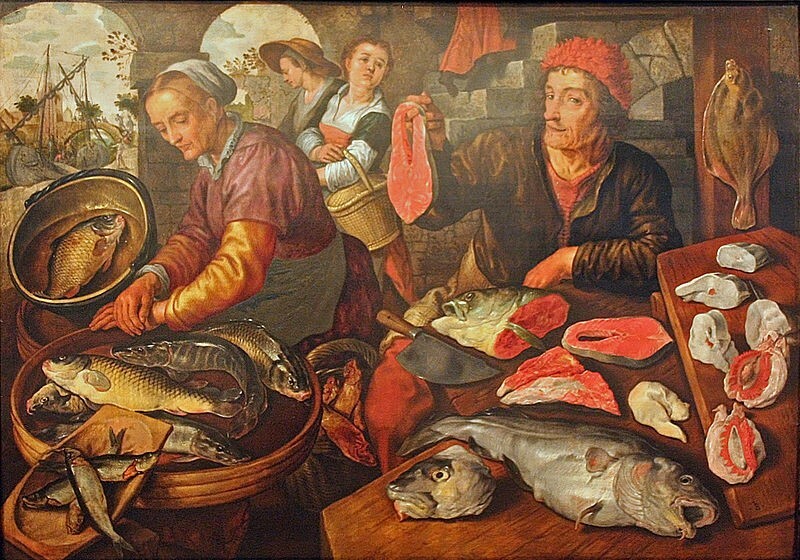 Reasons to eat fish included living near an ocean, a river or lake; the high expense and low availability of land and air based meat; religiously imposed Fast Days where all other meat was off the menu anyway; and the intrinsic link between diet and health (fish are wet – the perfect remedy if one’s humours are too dry). When buying from your local monger, don’t be shy! Have them clean it for you; if they fillet, ask for the frame back and make stock; and ask to find out which fish are slippery and/ or spikey. Importantly: Be Flexible. Eel isn’t everywhere, firm-white-fish is firm-white-fish, and sometimes there are just no oysters to be had. Seafood is seasonal, delicate, and in this day and age, subject to legally enforced catch limitations. Go with the flow. Bear in mind not everyone likes fish. Don’t jump in the deep end straight away if you’re novice. Fish is a fair bit of effort. And by effort I mean it’s smelly and messy. If you’re catering, maybe start with tinned sardines, pickled mussels, smoked trout portions, canned salmon, and pre-cooked prawns. If cooking wrap fillets and whole fish in foil, it keeps the moisture in, and makes cleaning up easier. Seafood is often considered to be expensive, and while some of it is, there’s a lot you can do at $20-30/kg or less. Mussels, Sardines, Trout and Salmon, Mackerel, and Prawns (to name a few) are at a fairly accessible price point. Endangered creatures: Porpoise, Whale, Seal, Turtle? ..Yeeeah, if you could not kill cook or eat those, that’d be greeeat. Medieval logic says Beavers live in water and their tails are without hair, therefore Fish! This logic is flawed. Also, refer to above point 3. Whole Fish will generally come cleaned (the retailer will gut them for you, you can ask for it with or without the head). Trout and Salmon always come cleaned. Some fish can be filleted by the retailer if practicable – but if buying whole fish, you may as well keep it whole. Fillets tend to have skin and/ or bones. Depending on what you’ve got, you may be able to slice the bones out or get them out using tweezers. Some bones are so small or soft they’re edible. Some skin tastes really good crisped up, or is so thin, soft, and mild it can be easily eaten. The tail pieces of large fish often don’t have bones. Shellfish (Crustacea) can be spiky and are the most likely to cause severe allergic reactions. Shellfish (Mollusks) are easier to handle, but should still be treated with general caution. Cephalopods (Squid/ Octopus) sometimes come cleaned and sometimes don’t. Your retailer will can clean these for you if you ask (you should ask). The Other Important Thing Is: Be Hygienic. Seafood is about as dangerous as chicken, not much more, not much less. Buy from a reputable source. Prepare and serve in a clean space. Be vigilant of cross contamination. Wash everything shortly after use in hot soapy water. Plan to cook on bin night if you can. Pope Gregory I declared rabbit to be fish because they swam in the ground, and therefore could be eaten during Lent. Much nicer than smelly, wet things.